Dub Invasion Festival Lands On The East Coast : The Record The 10-day-long festival is as much a celebration of dub - arguably the most significant popular music of the 20th century - as an exploration of its stylistic progeny. Lee "Scratch" Perry performing at the Dub Invasion Festival in New York City on Sept. 10. 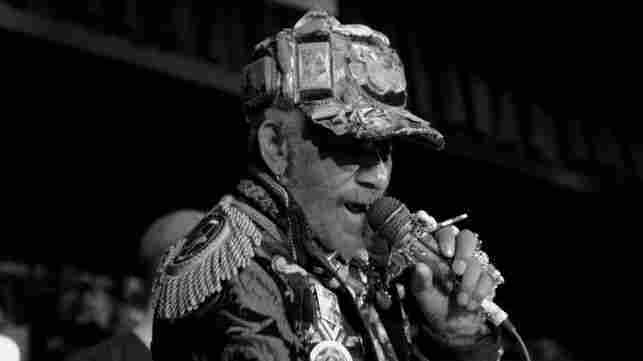 With edgy crowds filtering through police searchpoints, their ears blasted by loud motorbikes, Times Square on the eve of Sept. 11 last weekend was an appropriately surreal context for the appearance of diminutive dubmaster, Lee "Scratch" Perry. Despite official warnings to steer clear, crowds of dub fans braved the barricades to get close to their hero. The producer who shaped some of Bob Marley and the Wailers' boldest tracks, Scratch is adored for his sizzling, mind-blowing soundscapes; he is one of a generation including the late King Tubby whose audio audacity gave birth to to what is arguably the most significant popular music of the 20th century — Jamaican dub. For behold, dub gave birth to hip-hop, electronica, drum'n'bass, grunge, jungle, dubstep and, some would even argue, the great lingua franca of today's dancefloors: house music. Scratch's presence alongside other innovators like the U.K.'s Adrian Sherwood and Mad Professor and voices of dub's new generation like Vienna's Dubblestandart sound system and dubstep vocalist Jahdan Blakkamoore, gives authenticity to the Dub Invasion Festival which is currently moving between New York and Boston. It is the first such systematic presentation of the thrilling art of dub, which in the 1970s established Jamaica as the pioneering source of all future dance sounds. It was the first music to use the studio as an instrument at a pre-video time when users weren't able to talk back to their technology. Francois K is a French house DJ who is participating in the festival and hosts the popular Deep Space parties. In his mission statement, he declares: "Dub has been present in popular music since its early '70s Jamaican reggae roots, also filtering into dance music in later decades, without ever being widely acknowledged for what it is: a truly groundbreaking conceptual art form equal in significance to other giant aesthetic leaps such as Cubism or jazz." To make a dub, an existing track is stripped down to the recording desk's individual fader tracks of instruments and vocals, then re-assembled differently as a dub version. On the flip side of reggae singles, you expect to get a dub version — the same song, but utterly re-invented. The essence of dub is the unexpected, so you'll hear elements of the original sound suddenly expanded by quivering reverb, then dramatically silenced, only to return when you least expect them — but always right on time. Dub means adventure. All dance musics use dub's studio tricks, its ghostly deployment of echo, reverb and rewind. Nowadays, we expect records to come with a bunch of DJ re-mixes. Dub IS a remix, it's where it began. You can trace rap and hip-hop back to the African griots' oral tradition, but really, hip-hop rapping stems from dub. DJs who introduced records at a sound system would often "chat" on the re-vamped riddim, and they soon crossed over to the recording studio. Sampling and use of found sound? In its pursuit of the unexpected, dub started it, throwing anything in from a crying baby to a police siren or idle studio banter. In a sense, the media and technology have grown up to shape the sort of multi-sensory world that dub predicted three decades ago. With the motto, "Respect The Foundation," the Invasion's organizers, Emch of Subatomic Sound System and Quoc Pham of Sound Liberation Front, are musicians whose mission is to keep awareness of dub's role alive. They collaborated with Manhattan's lively dub, DJ and mixing academy, Dubspot, who organized master class seminars with producers, enabling the festival to come at their fan base from all directions, just like a dramatic, sensurround dub mix. Dub aficionadoes can attend the festival workshops online and even participate (classes can be found at Dubstop's site). All dub's shoots have taken wing and flown. But now, Emch and Pham feel, the branches have overshadowed the roots. Most dance tracks today are done by a solo human and a computer. Back in the day, to cut a dub, though you might have one auteur producer (like a Lee Perry), equally often the mix would be improvised by several sets of hands dancing round each other over the mixing desk faders. Pushing up one instrument, pulling another out for a crucial two bars then dropping it back in; making a crooned vocal blur then swoop in a wicked flange of ambient sound, then come back sweet as a bird, singing the same phrase three times, getting quieter with each repeat. The original track would be dismantled and re-assembled in a deliberately off-kilter way that would keep the dancers guessing. Dub is dependent on a human element, our rhythm, hands, heart and ears, that a computer can only be programmed to replicate, never feel. Says Emch, "We want to make the connection. Kids today are hardly playing drums and guitars, it's all drum machines and laptops. It's fine to use computers but it's important to understand where the music comes from. There's so much soul and culture in reggae. Injecting your soul into a laptop is harder than it is with a guitar." With its fractured sensibility, the frisson of never knowing where a track will go next, dub captured the edgy, fractured sensibility of the '70s. The old order was crumbling to make way for a newly multiracial reality At the time of dub's first wave, punk was yowling in the streets; America was still recovering from the national double vision of hippies vs. Vietnam; unemployment was high in Britain and Jamaica and their left-wing governments were seeing if socialism could stave off the system's collapse — only to be replaced by the right before the results were fully in. Sound familiar? A fixture at international dub and reggae events, Sherwood has seen the world of dub expand from basement "shebeen" parties in squats to events like the Dub Invasion and the recent Rototom Reggae Festival in Spain which attracted more than 200,000 attendees. "Dub has more space and tone and encompasses and inspires all sorts of music," says Sherwood. "But at the heart of everything related to dub, whether its old or new, is the original Jamaican stuff. It was really saying something."